Pete Cosey, guitarist extraordinaire, passed away on May 30, 2012. He was 68. He was a session guitar player at Chess Records until 1973, playing on recordings by Etta James, Howlin’ Wolf and Muddy Waters, among many others. 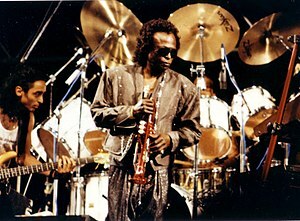 In 1973, he joined the Miles Davis Band and played with them until 1975. When the band broke up in 1975, he pretty much disappeared, surfacing from time to time to play on someone’s record. He resurfaced somewhat in 2001, forming a band, The Children of Agharta. Check out the clips I have included. The guy was amazing. This entry was posted in Blues, Funk, Jazz, Live Music, Remembering and tagged Blues, Chess Records, Funk, Jazz, Music, Pete Cosey. Bookmark the permalink.